Getting our gear together was fun. We decided to buy nice new goretex raingear, but that was about it. We’d use our old gear for everything else, as we were experienced backpackers and had collected a good supply over the years. Choosing sleeping bags was tricky, as we didn’t know how cold it might get up at 10,000 feet elevation, even in high summer. We ended up choosing two goose down bags, the lightest and warmest ones we had. Then we had to get fuel and food. 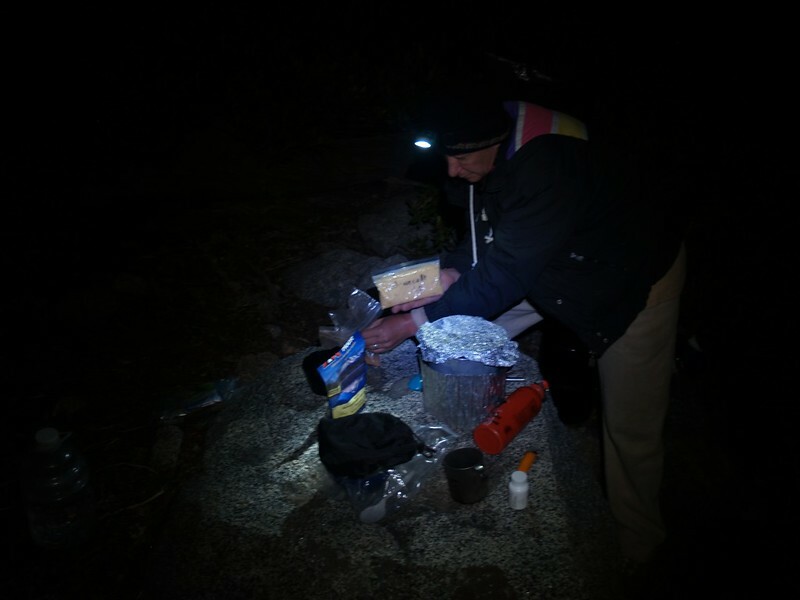 We stuck with our trusty Whisperlite stove and took a full bottle of gas. On a previous trip I actually weighed the gas we used, and it came out to 23 grams per day, so a 20 ounce bottle would be way more than enough. We went with a bunch of store-bought freeze-dried dinners and breakfasts, but created our own do-it-yourself lunches and snacks. Packed and ready, we left San Diego at 10pm for the eight hour drive to Roads End, on Highway 180, in Kings Canyon National Park. We entered the park at 5am and the toll booth was closed, so we didn’t pay the entry fee. We figured we’d pay it when we left. 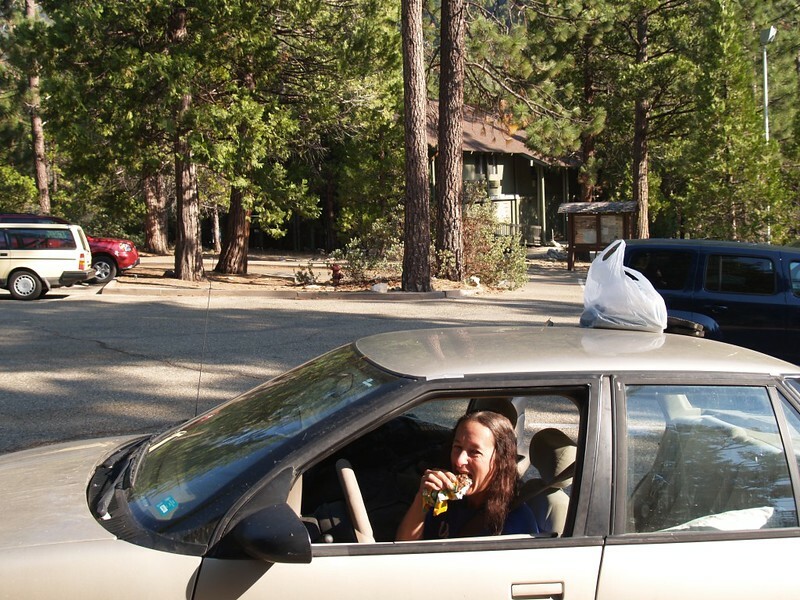 Meanwhile, we had to arrive at the Ranger Station before 7am so that we could get our permit and get hiking right away. We had a long climb ahead of us. We were early enough that I took a short nap while Vicki waited in line. Soon we had our permit. 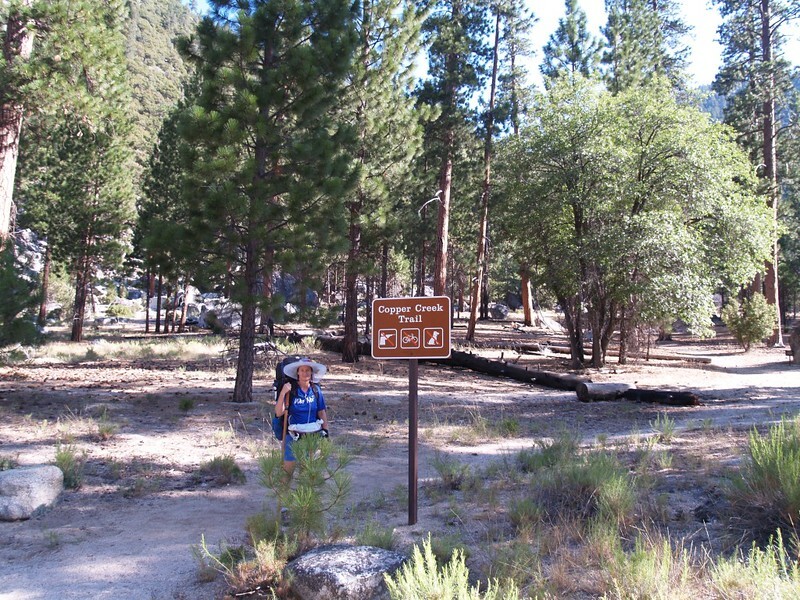 We parked the car at the trailhead for the Copper Creek Trail, and finished packing. Any extra food from the car went in the bear box. 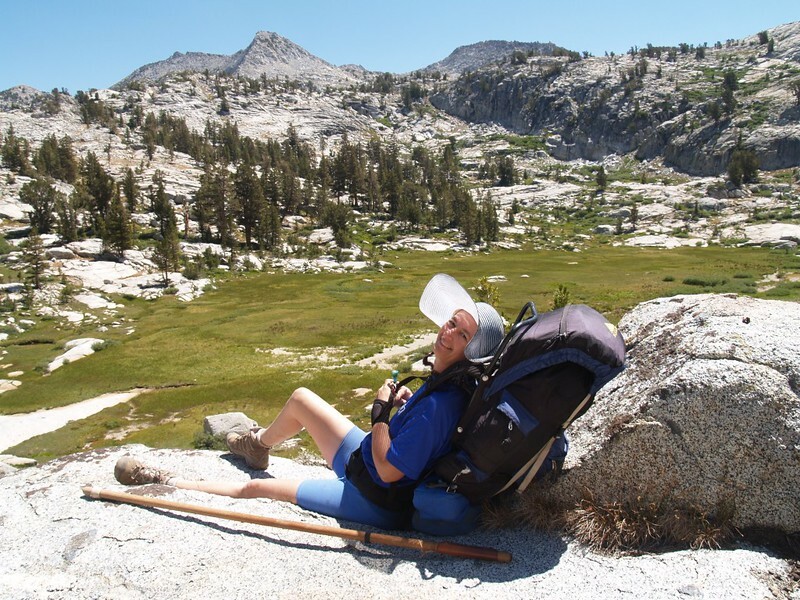 We took a deep breath, shouldered our packs, and began hiking. 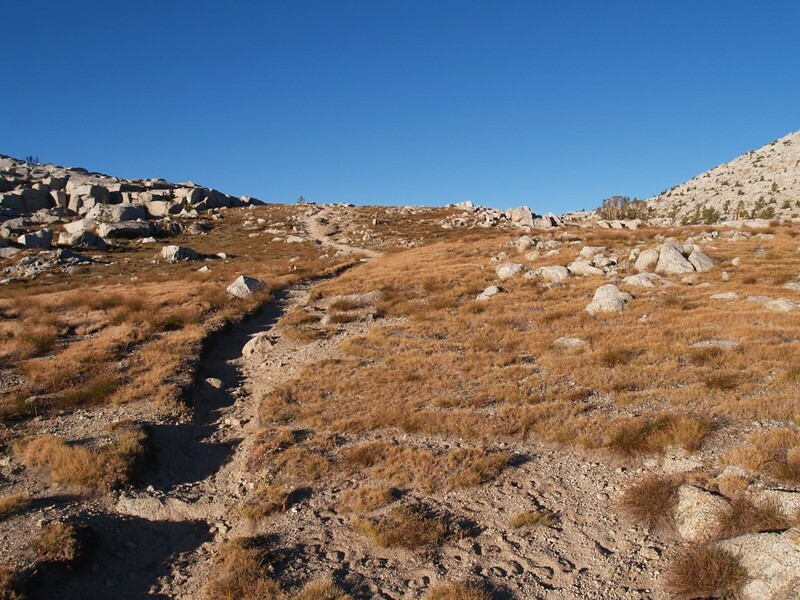 We had some serious switchbacks ahead of us, on a 2500 foot climb to Lower Tent Meadow. Getting near Lower Tent Meadow on the Copper Creek Trail. 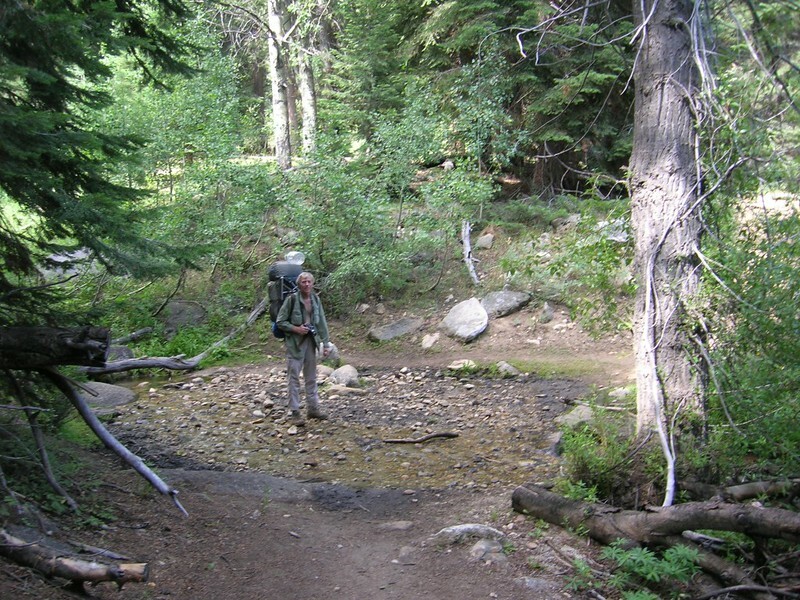 Copper Creek where it crosses the trail at the Lower Tent Meadow campsite. 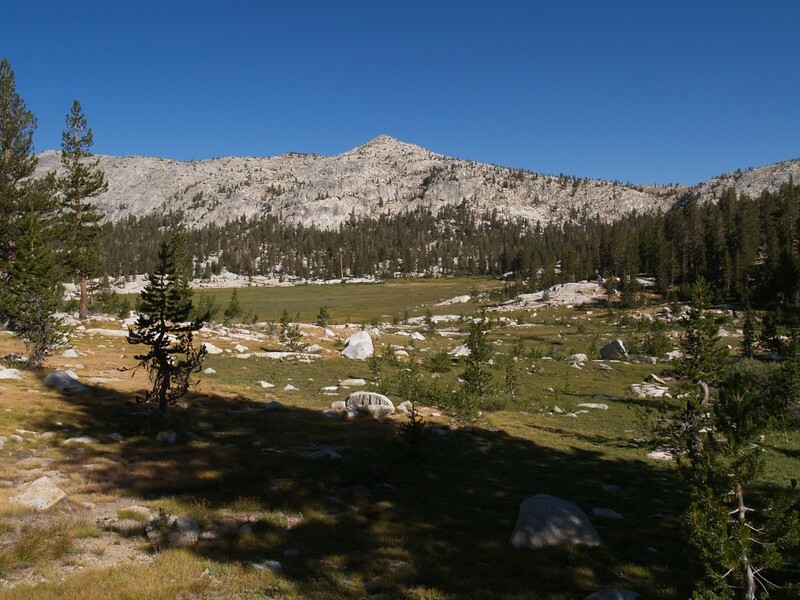 We Stayed the first night at Lower Tent Meadow, then hiked up into Granite Basin the second night. This was yet another 2500 feet of climbing! It takes a lot of work to get into the high country when you start at 5000 feet elevation. 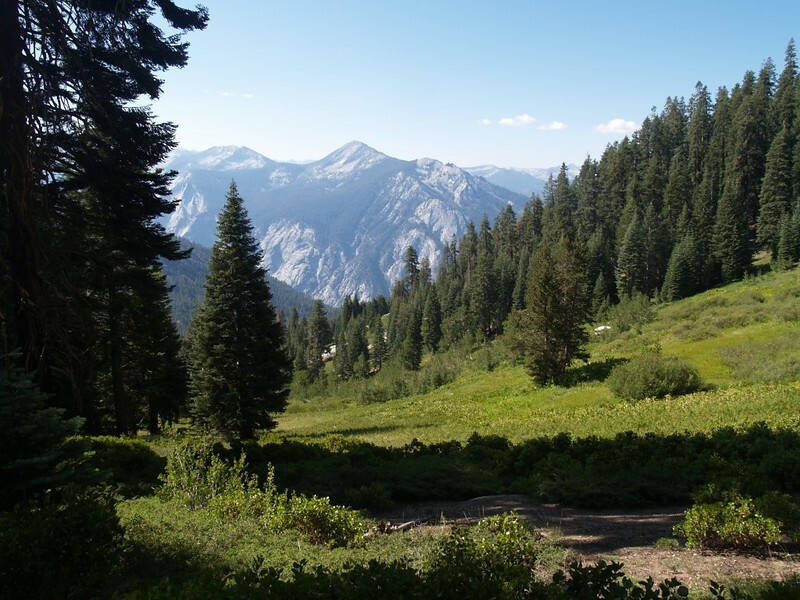 We climbed up through the high sloping area known as Upper Tent Meadow, until we finally made it into some cool, shady forest. We ate lunch and Vicki took a nap. Then we climbed some more. Lots more. 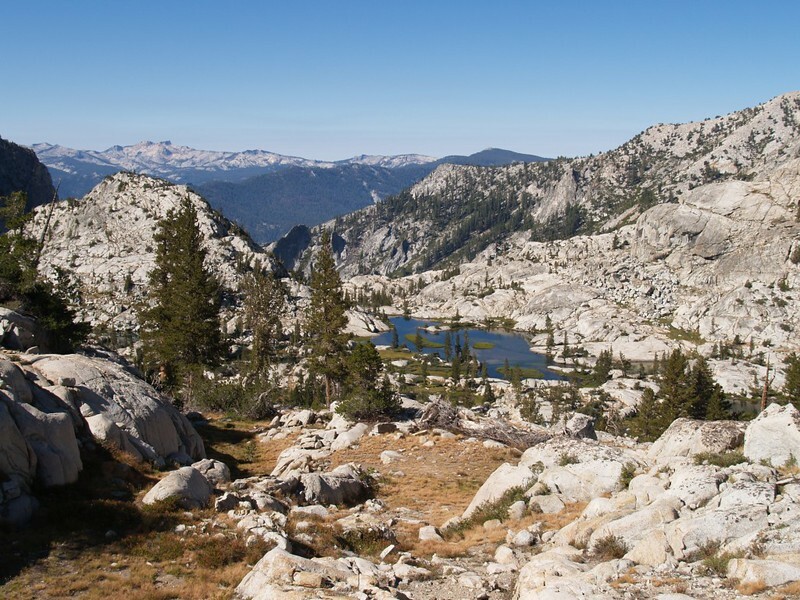 Eventually we crested and dropped down into beautiful Granite Basin. Vicki was utterly exhausted by this point, so we found a spot to camp, set up the tent, and she crawled inside and crashed. I still had energy so I hiked down to a small lake and filtered some water. It was very peaceful there. By the time I got back Vicki was feeling better. We ate some dinner and watched the sunset. 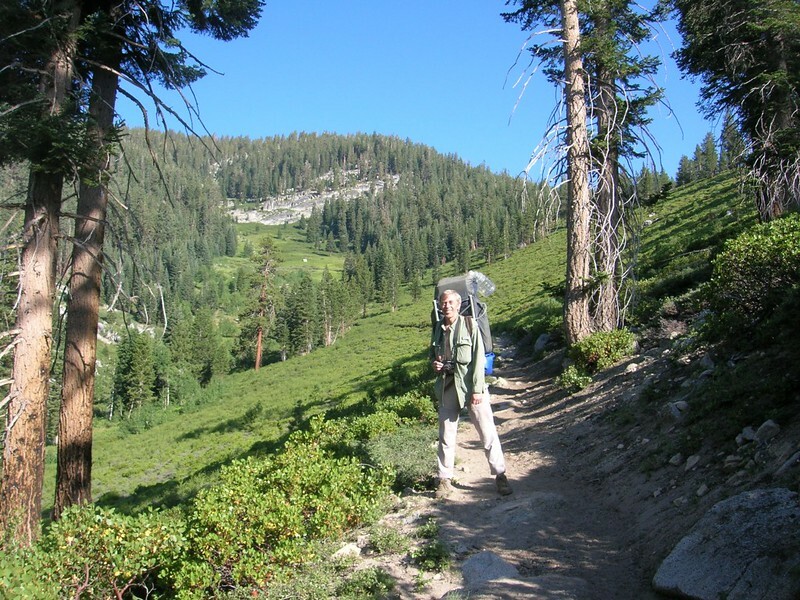 Me, hiking in Upper Tent Meadow. 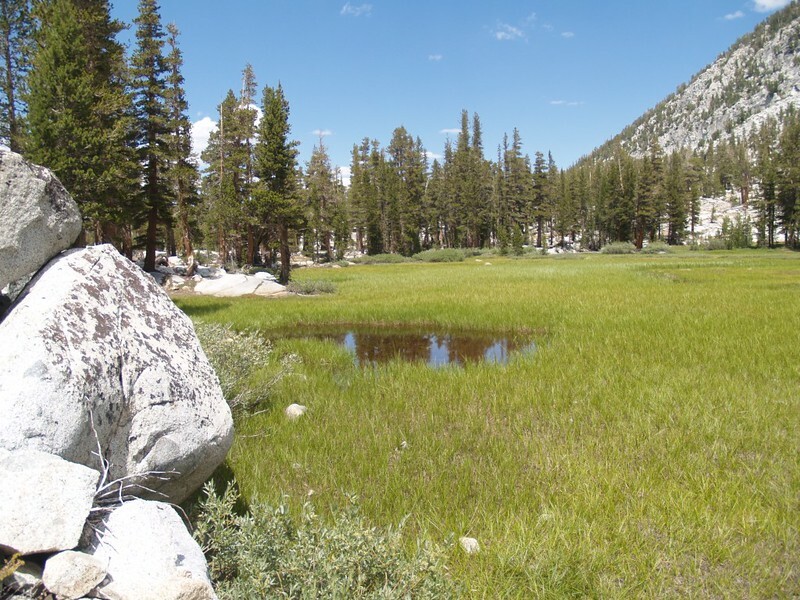 The upper reaches of Upper Tent Meadow. 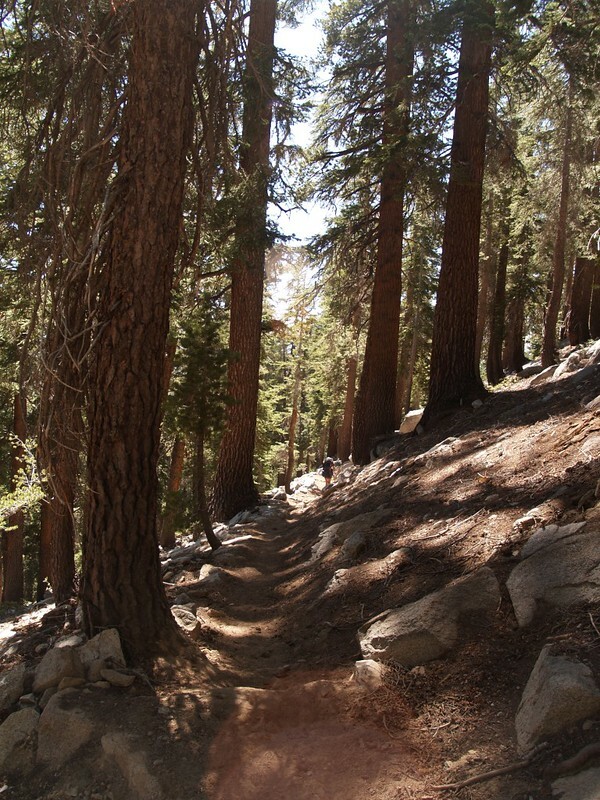 Switchbacks on the Copper Creek Trail, hiking through some beautiful pine forest. 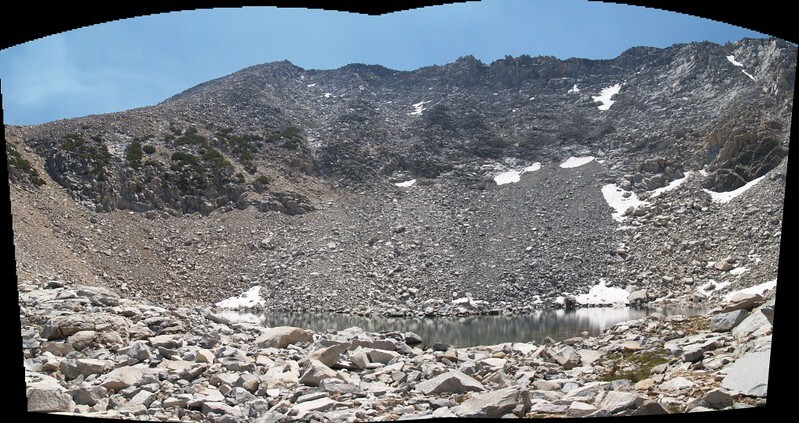 Panorama shot of lower Granite Basin, with Mount Hutchings on the left. Small lake in Granite Basin where I pumped water. 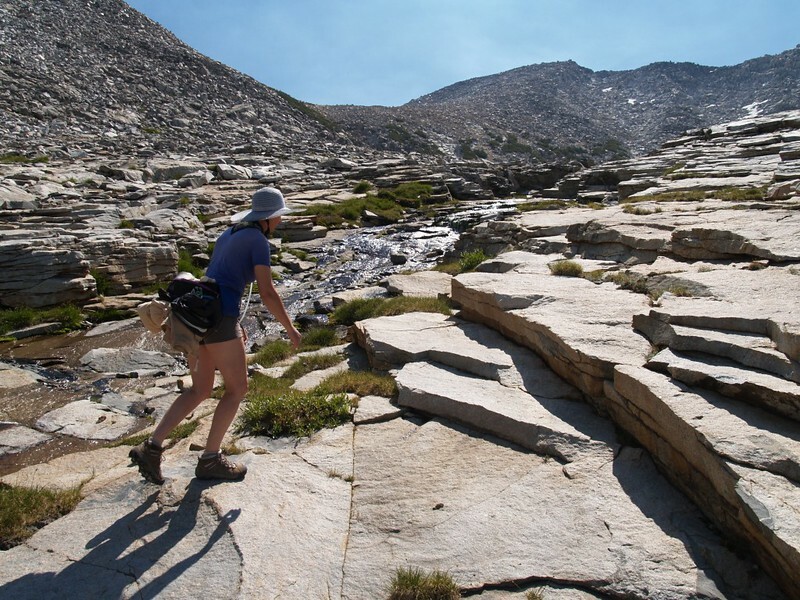 On the third day we traversed Granite Basin. 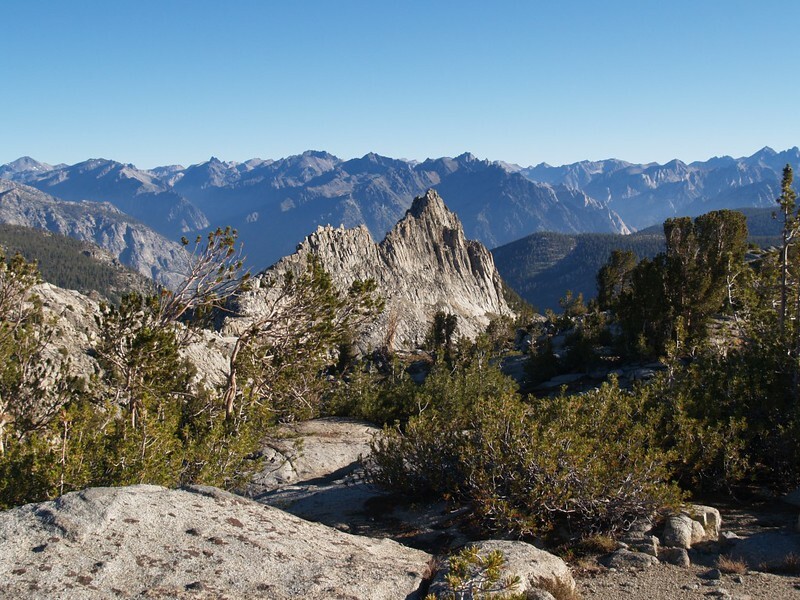 We hiked up and over Granite Pass (elev 10670 feet) where we enjoyed the views of the Sierra high country including the Black Divide. 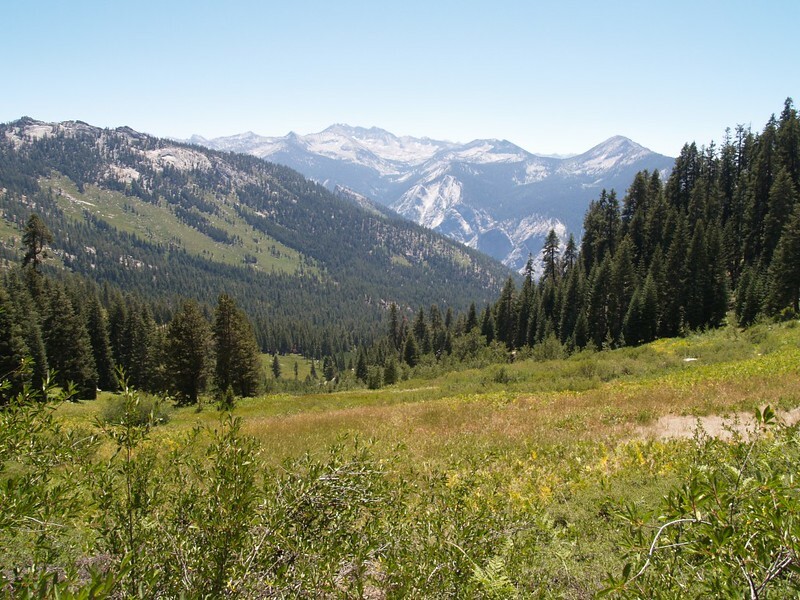 We headed downhill along the Middle Fork of Dougherty Creek and passed many idyllic meadows. We ate lunch and continued onward until we were getting tired. 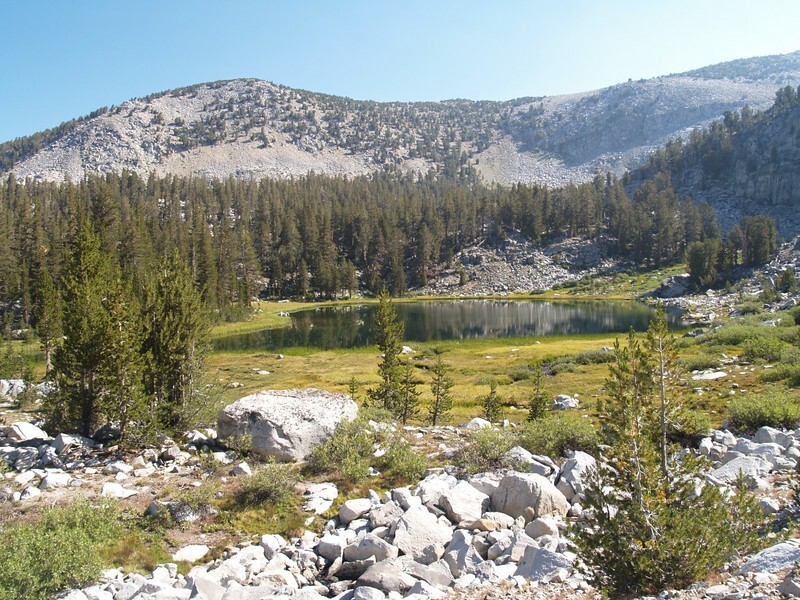 I noticed on the map that there was an un-named lake just to the north of Peak 10782 on the Kennedy Meadow Trail. We camped there for the night. We called it “Private Lake” because we had it all to ourselves. 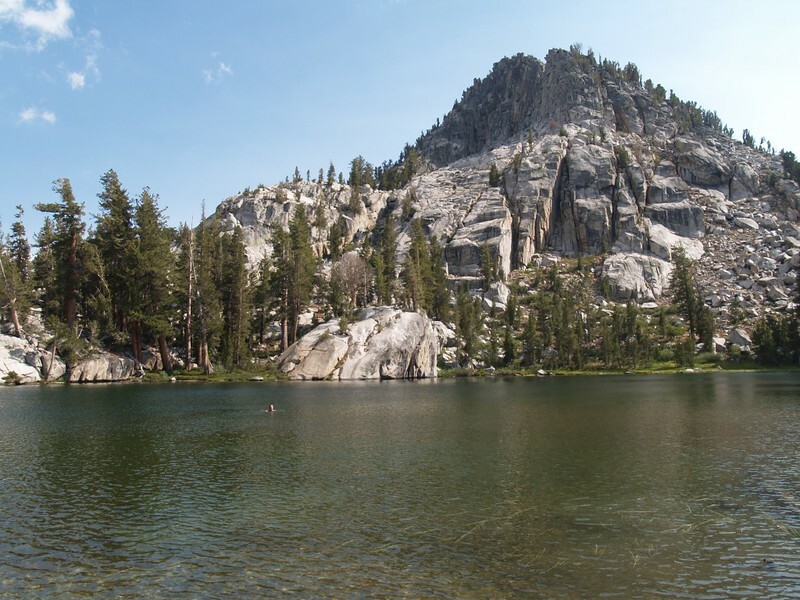 Unlike most High Sierra lakes, it was warm enough to swim in. Well, it was warm enough for Vicki to swim in. I just gave myself a splash-bath. 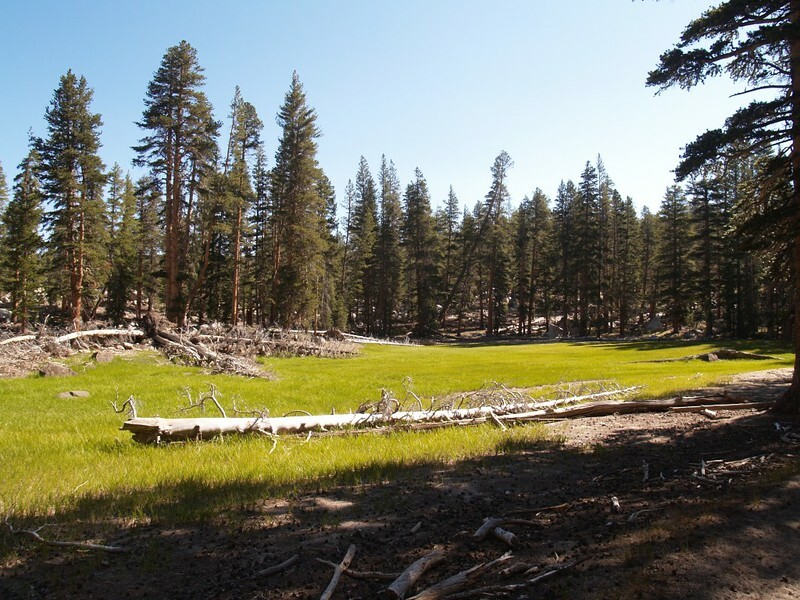 The largest meadow in Granite Basin. 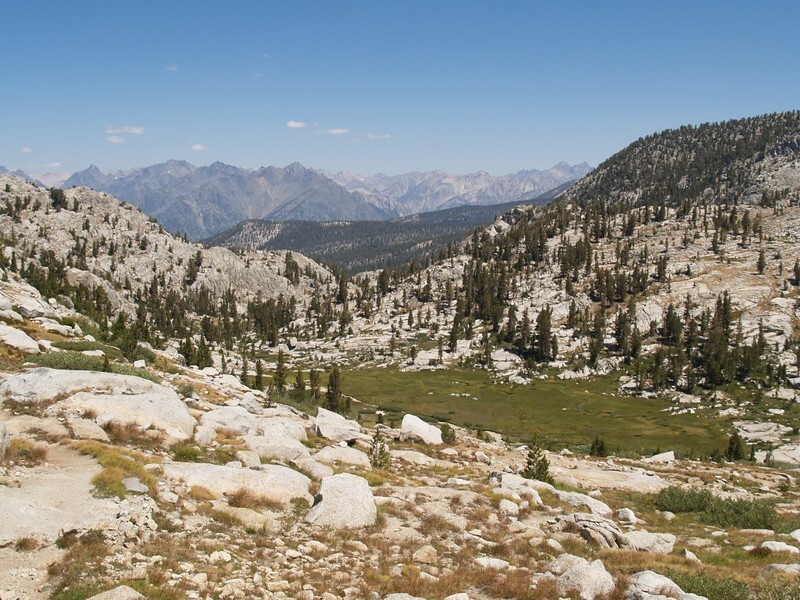 Granite Pass is on the right. 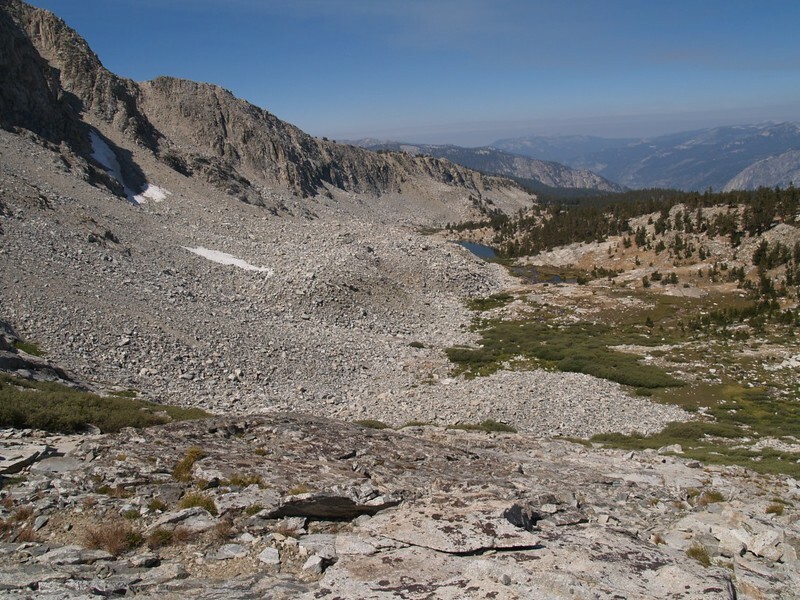 Looking south into Granite Basin while climbing the trail up the steep switchbacks to Granite Pass. 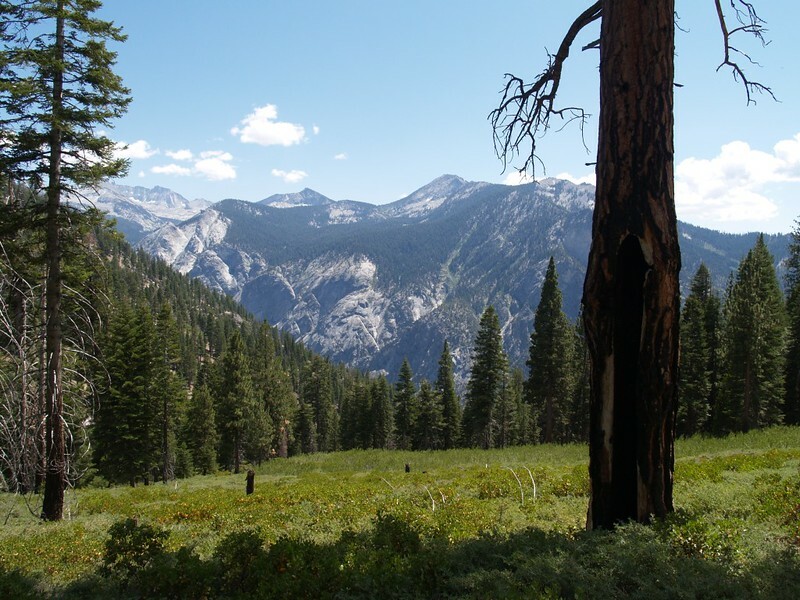 Meadows on the Middle Fork of Dougherty Creek, as we descend North from Granite Pass. A happy Vicki and a lovely meadow on the Middle Fork of Dougherty Creek. We had lunch here. Marshy meadow on the Middle Fork of Dougherty Creek, on the Simpson Meadow Trail. Vicki skinnydipping in “Private Lake”, with Peak 10782 in the background. Timer shot of the two of us, with “Private Lake” in the background. The next day we hiked onward past Glacier Valley to Upper State Lake, where we decided to stay two nights. 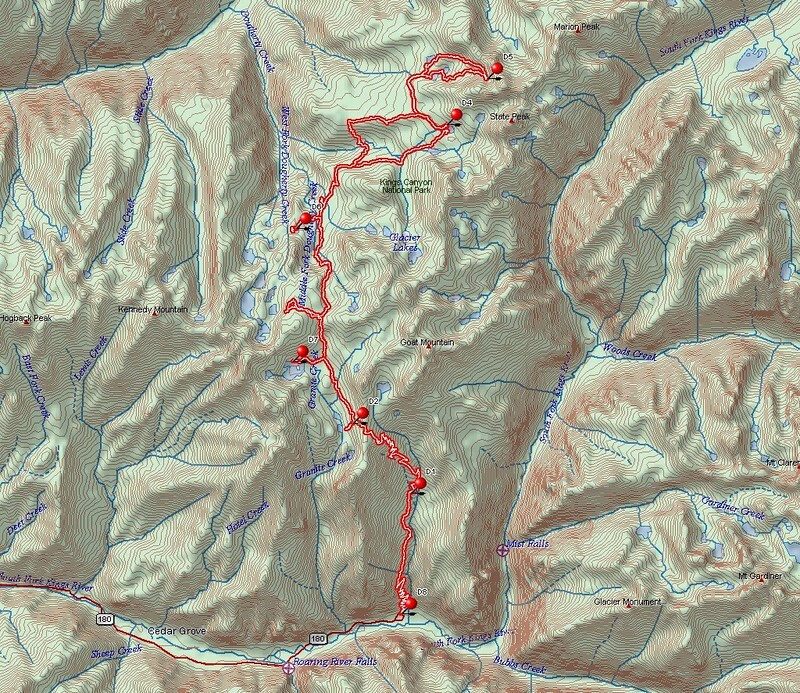 We hiked past Dougherty Meadow and ate lunch at the creek crossing in Glacier Valley. 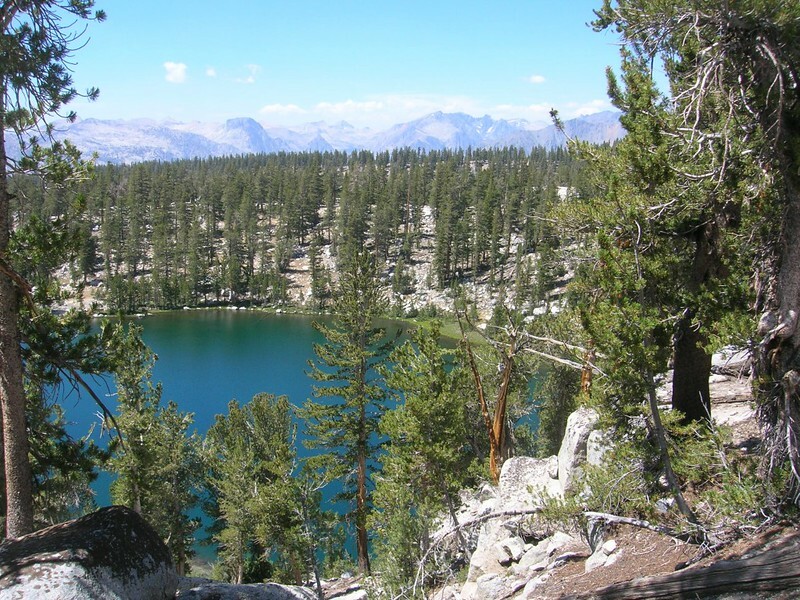 Then it was uphill to lower State Lake (Lake 10250) where we enjoyed the views. 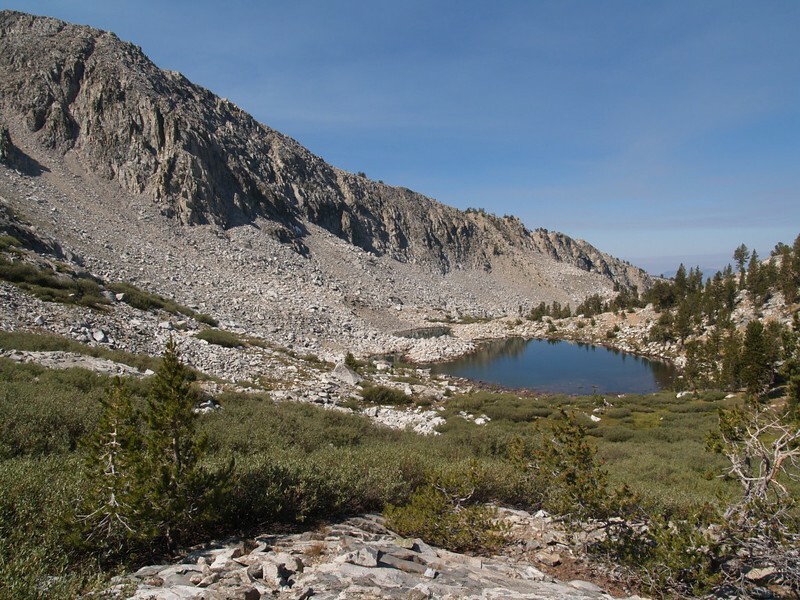 We still had some energy left, so we hiked onward and upward to Upper State Lake (elevation 10500 feet, or so). We put down our big packs and wandered around the west shoreline until we found a really nice spot under some huge cedars. This would be our base camp for the following day’s hike. 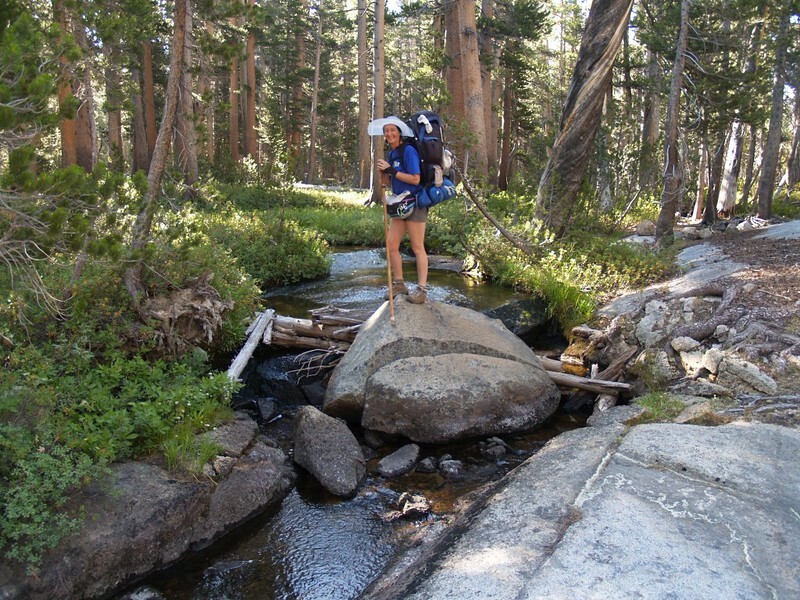 Vicki crossing the Middle Fork of Dougherty Creek, on the Simpson Meadow Trail. 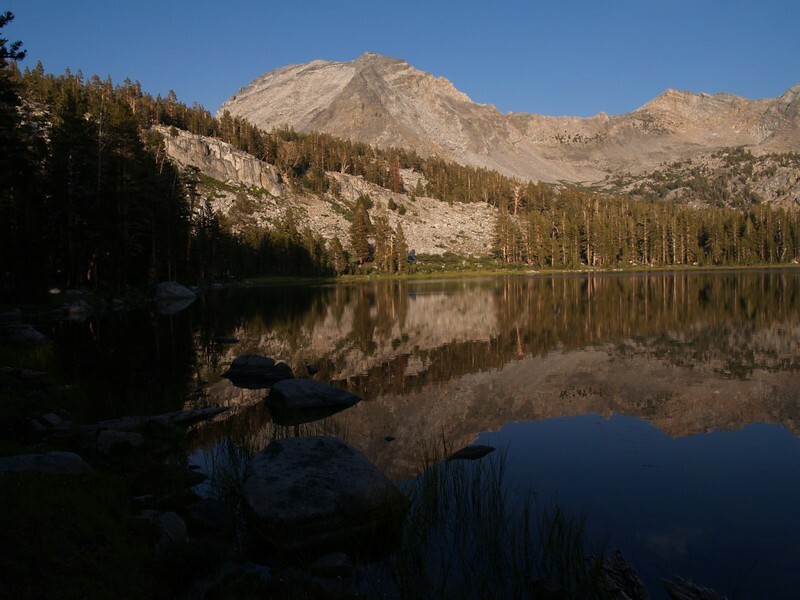 The view from our campsite at Upper State Lake. The fifth day was our lay-over day, and it was a pleasure to leave the tent set up, enjoying a morning without the usual rush to pack everything. 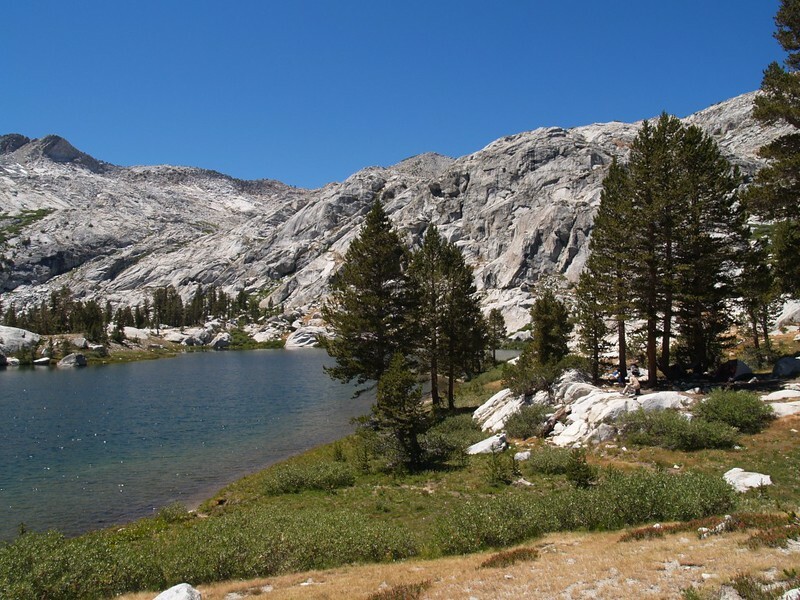 Our plan was to day-hike to the Horseshoe Lakes. 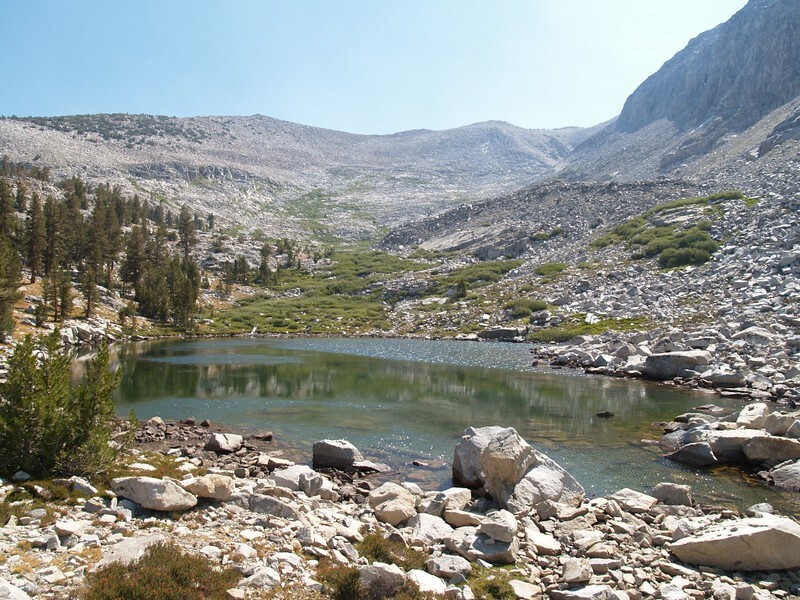 We climbed up Horseshoe Creek, passing several beautiful lakes on the way, until we reached the tiniest topmost tarn above the Horseshoe Creek watershed, at 11,450 feet elevation. The view over the Black Divide was fantastic. 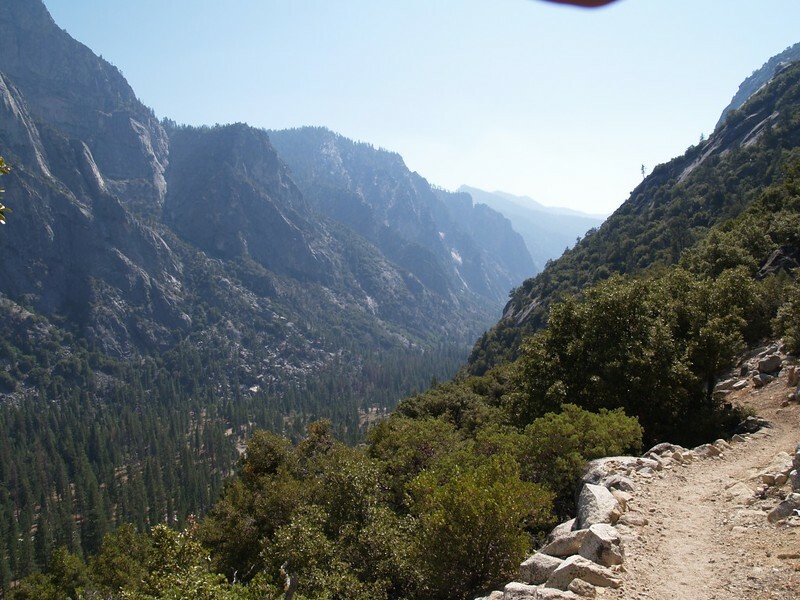 This was our first experience in Sierra Cross-Country Hiking (trail-less hiking) and we really enjoyed it. 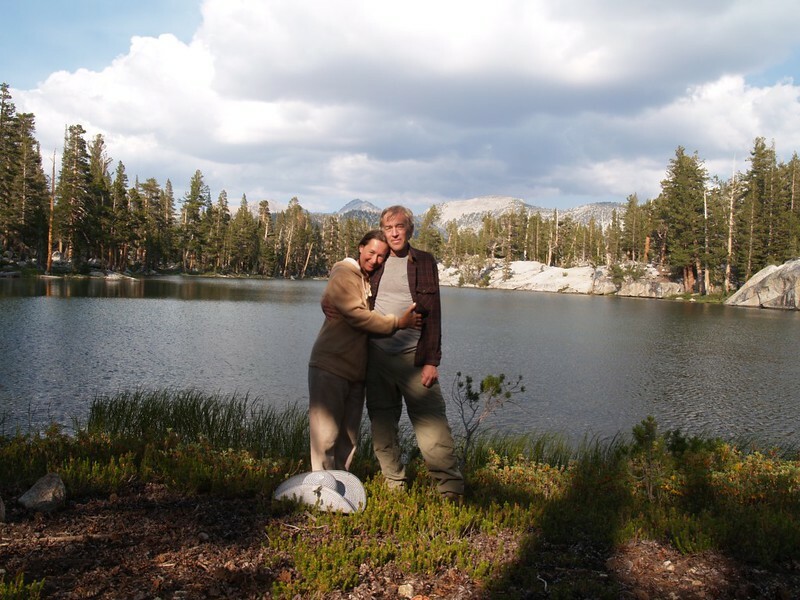 After checking out the largest Horseshoe lake on the way down, we hiked back to Upper State Lake and slept the good sleep. 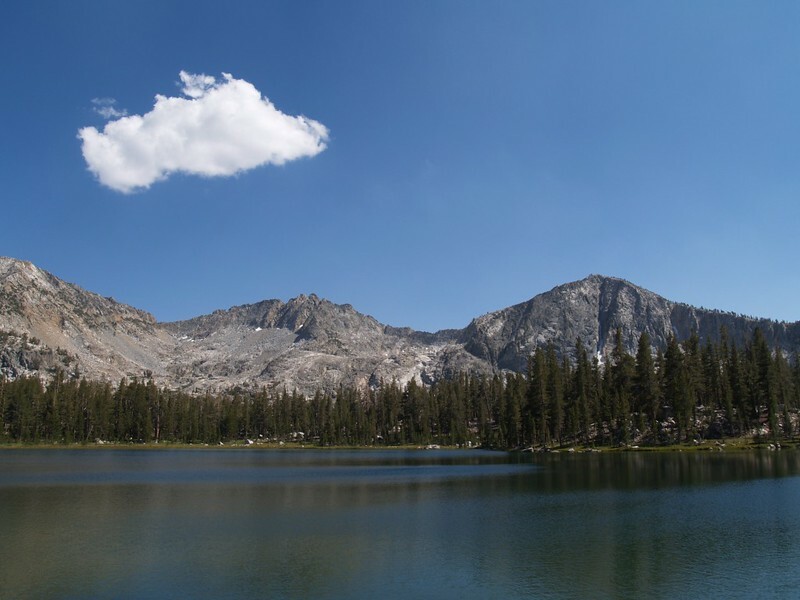 Panorama of the lowest lake in the southern group (a chain following Horseshoe Creek) of the Horseshoe Lakes. There were trout in this lake. 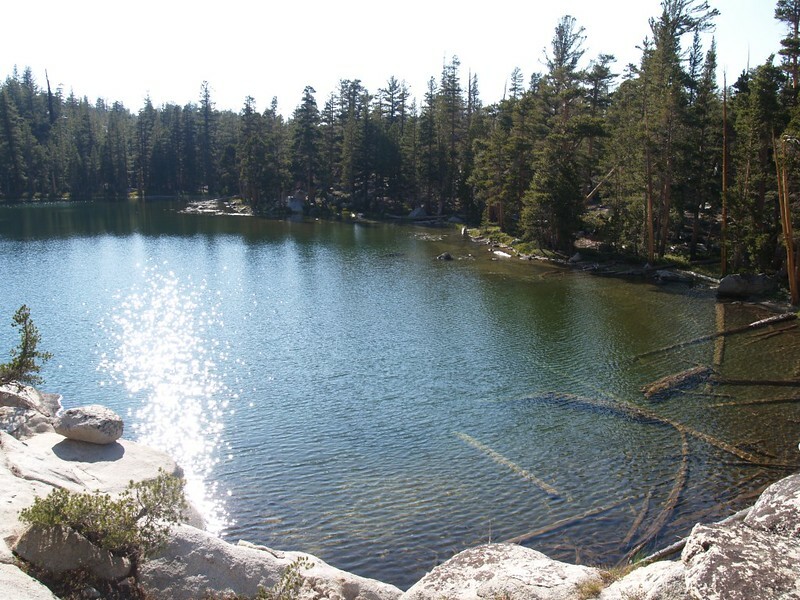 One of the Horseshoe Lakes. We could hear the creek flowing underneath this pile of boulders as we followed the watercourse higher. One of several small Horseshoe Lakes, as we climbed Horseshoe Creek. 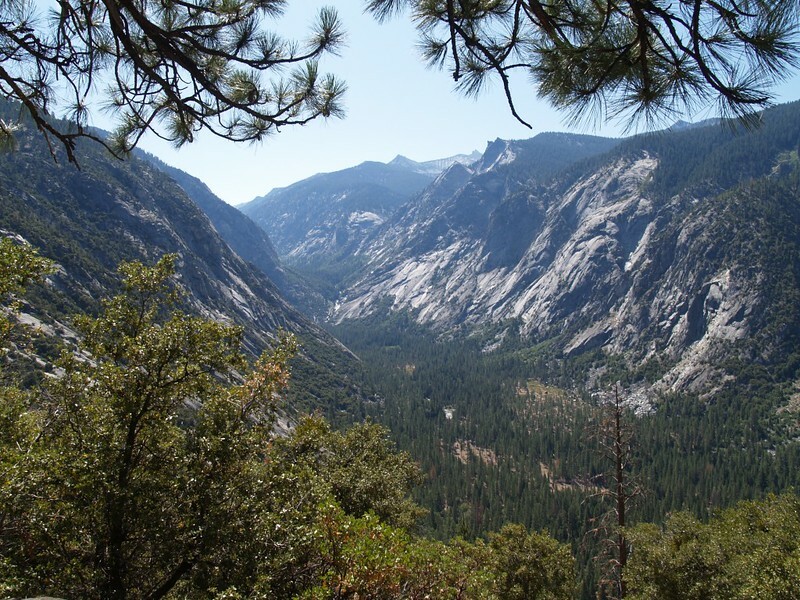 The small valley, right-of-center, is our eventual destination. Windy Ridge is seen above the lake. 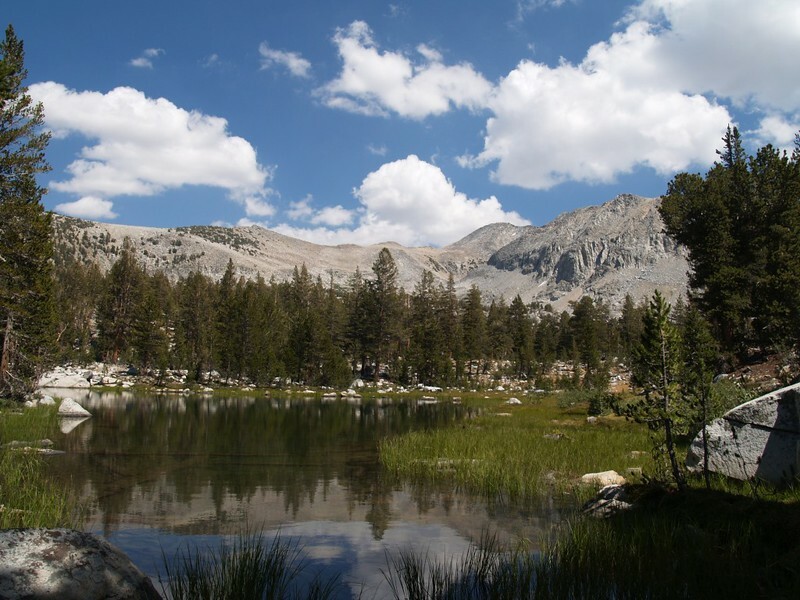 Looking back at the chain of small Horseshoe Lakes. Looking back down Horseshoe Creek. The topo map shows much larger patches of perennial snow along the north-facing slopes on the left. Vicki climbing glaciated slabs next to Horseshoe Creek. 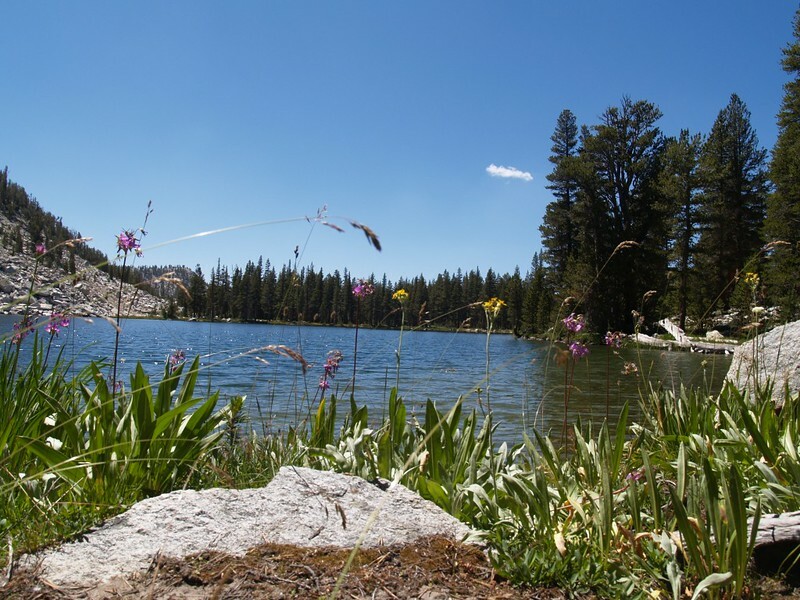 The highest of the Horseshoe Lakes, elevation 11,500 feet. Lake 10515 in the Horseshoe Lakes basin, looking east toward the high tarn and Windy Ridge. The next morning we packed up with heavier hearts, as we knew that we were heading back. We didn’t have much choice but to reverse our route, yet we still managed to find some new things to see along the way. 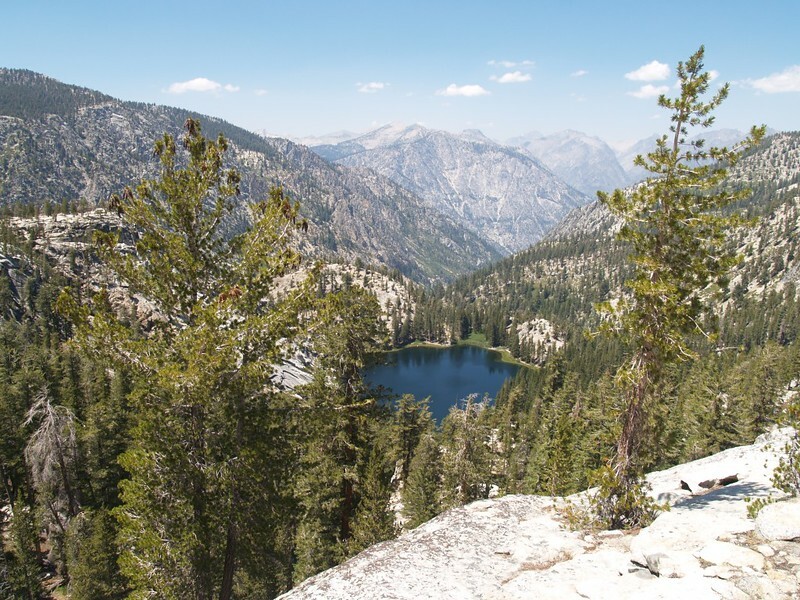 For starters, we took the other trail out of Upper State Lake, which had some nice views, and Vicki also found a non-published viewpoint for Lake of the Fallen Moon. We liked Private Lake so much that we were happy to go back there, even though it was slightly out of the way of the main trail. 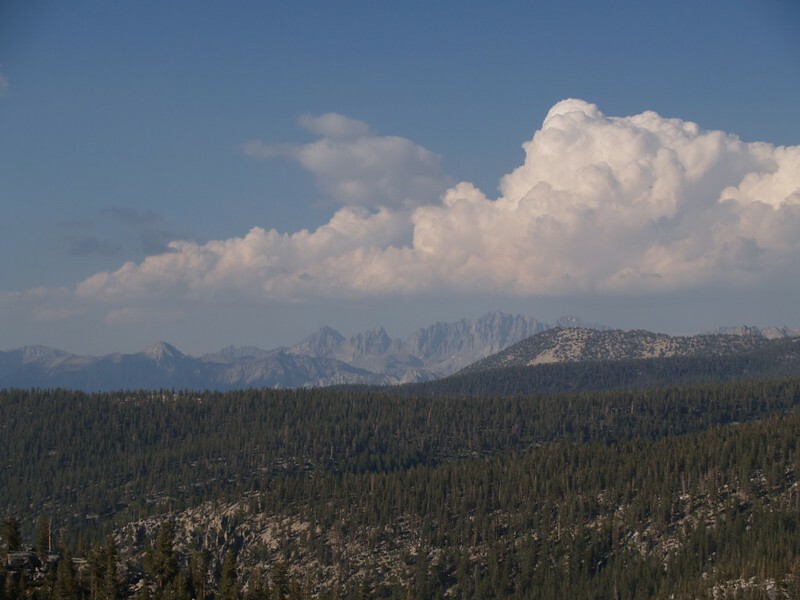 We climbed up above the lake after dinner and were treated to some fine views east to the Sierra Crest and the Palisades. A great way to end the day. 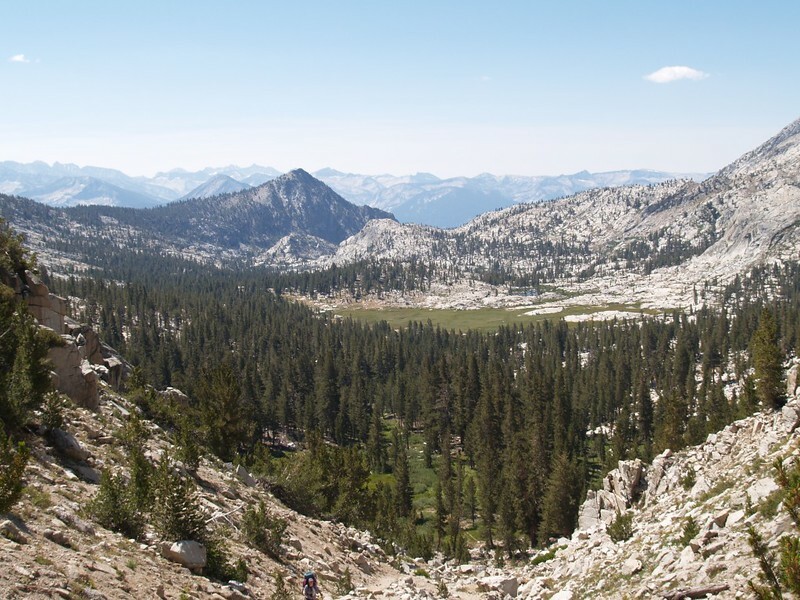 Heading back now, we hiked along the high trail from Upper State lake. This is the view south, looking up Glacier Valley. 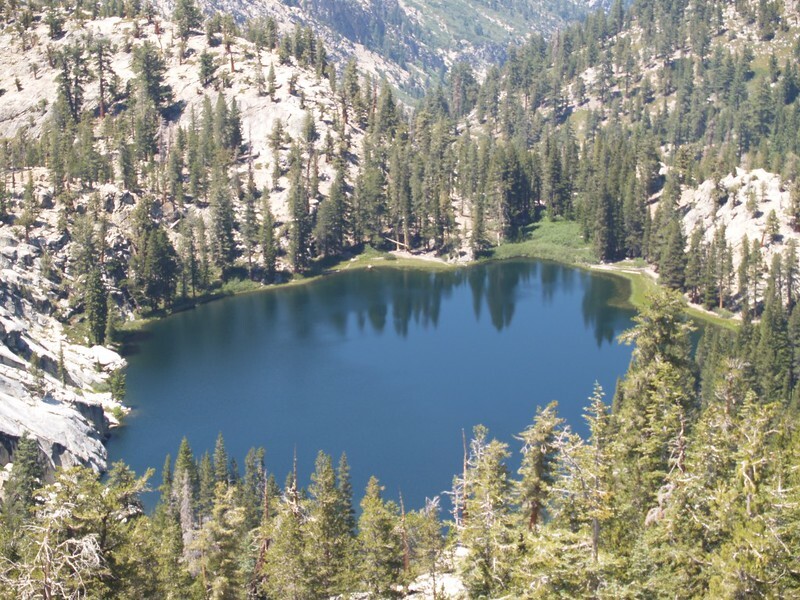 Vicki wanted to see this lake in the worst way, but there were no views along the main trail. Suddenly, she dropped her big pack, and insisted that we go off-trail to try to get one. So we did. I thought that it was yet another fruitless quest, but no! The view was exceptional, from a rocky cliff high above the lake. 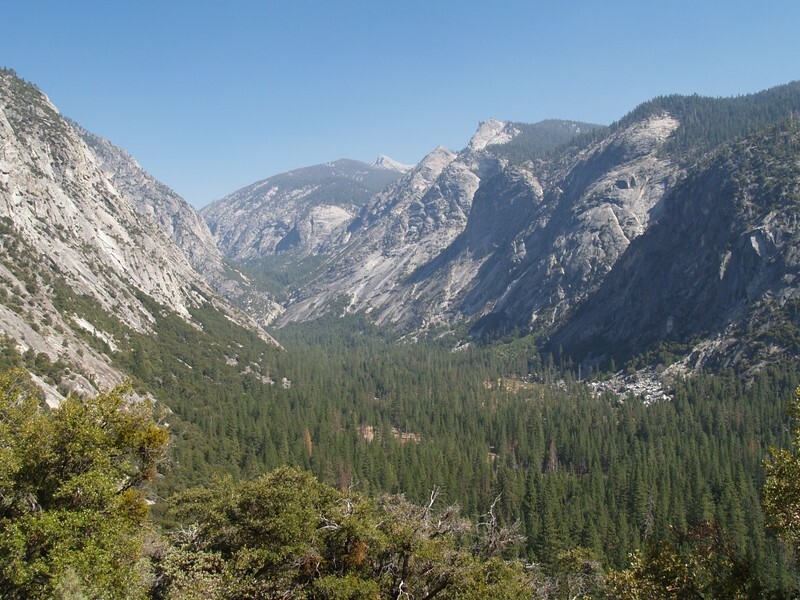 If you camped down there, the chances of a visit from another person would be nearly zero. Telephoto shot of the Lake of the Fallen Moon. From the eastern shore of “Private Lake.” Our campsite was on the right. Zoomed-in view of what I believe is the Palisade Crest, far to the northeast of us. Reflections from the higher pool above Private Lake. 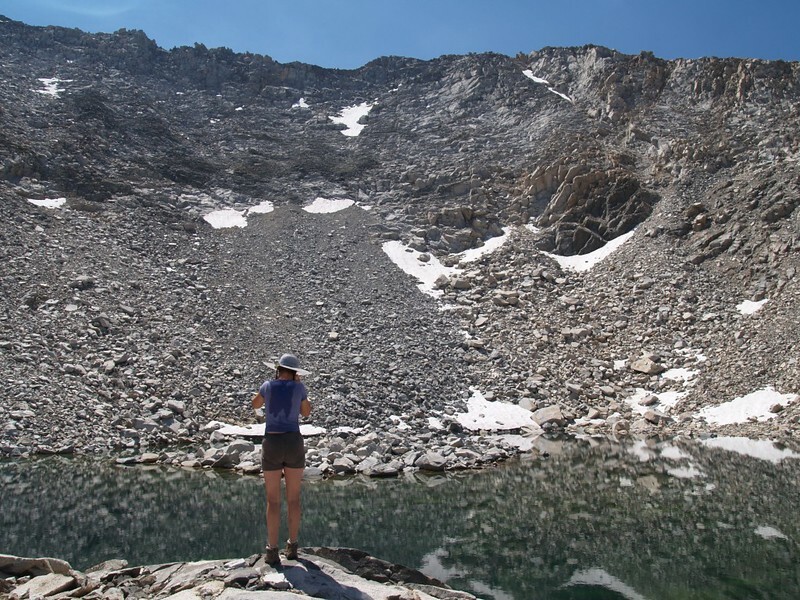 We left Private Lake at three AM to avoid the heat on the trail up to Granite Pass. It was cold and frosty that morning in the Dougherty Creek valley. 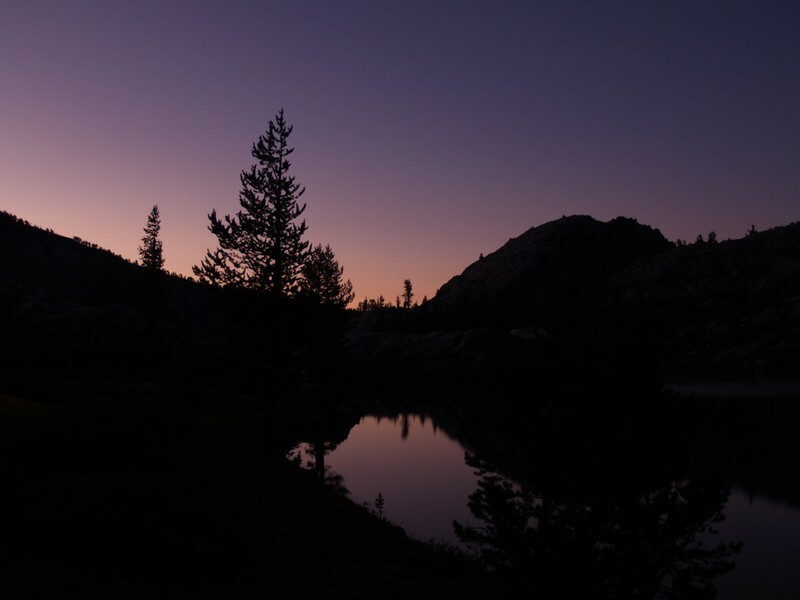 The sun rose as we crested the pass, at which point we dropped our big packs and traversed west in order to discover a glorious view of the Volcanic Lakes Basin. 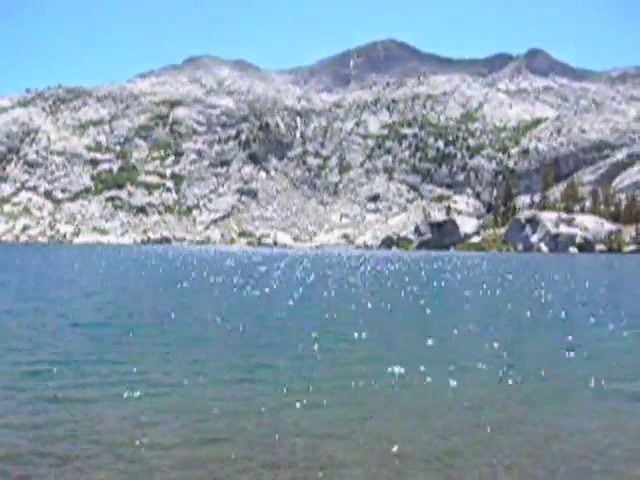 Then we descended Granite Pass and camped at Granite Lake. We had the place to ourselves all day. It was breezy but warm in the sun. 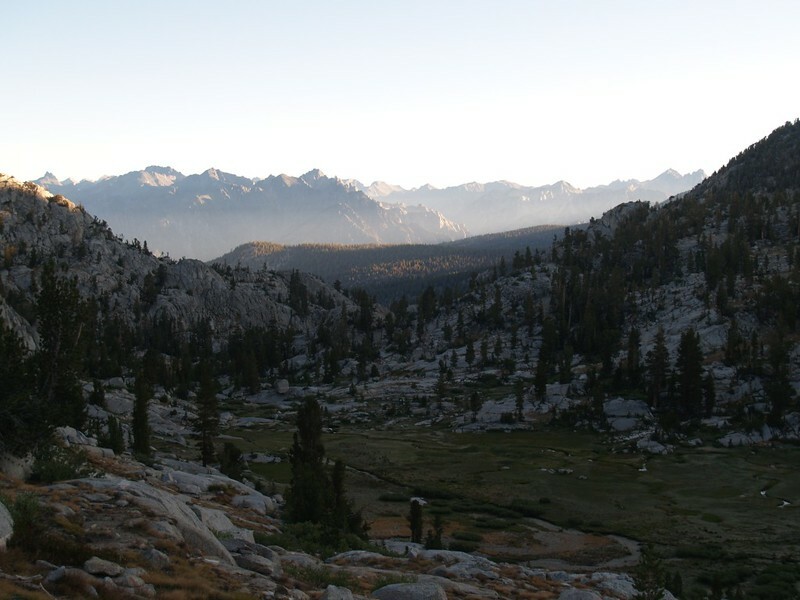 Dawn on the Simpson Meadows Trail, climbing up the Middle Fork of Dougherty Creek toward Granite Pass. There was frost on the meadow that morning. Cold! 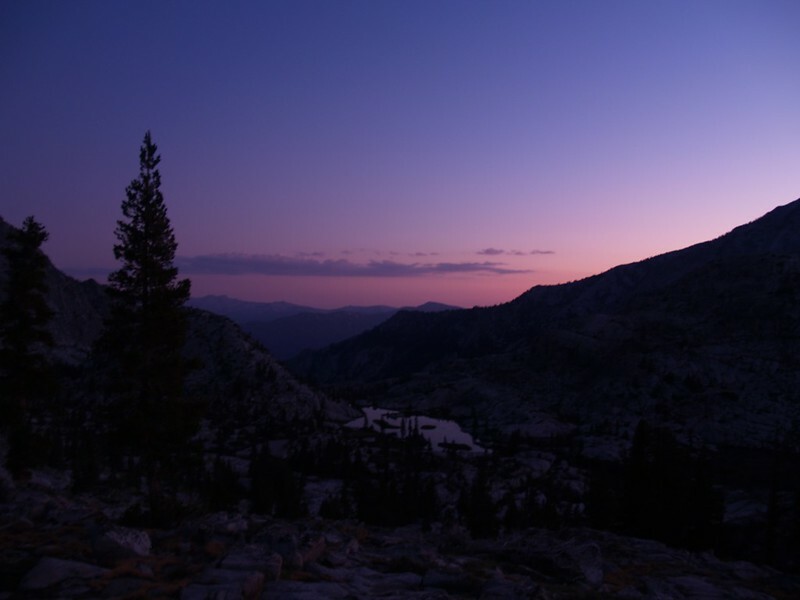 Dawn arrives just as we were nearing the top of Granite Pass. It felt good after the long, cold hike in the dark. 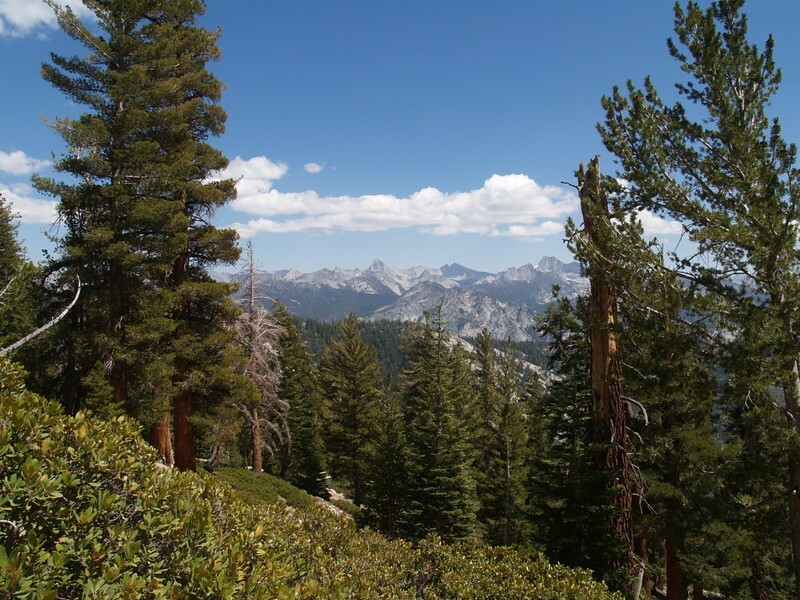 The view from just west of Granite Pass, back toward Peak 10782 and the Black Divide. Private Lake, where we began hiking that morning, is on the opposite side of the peak. 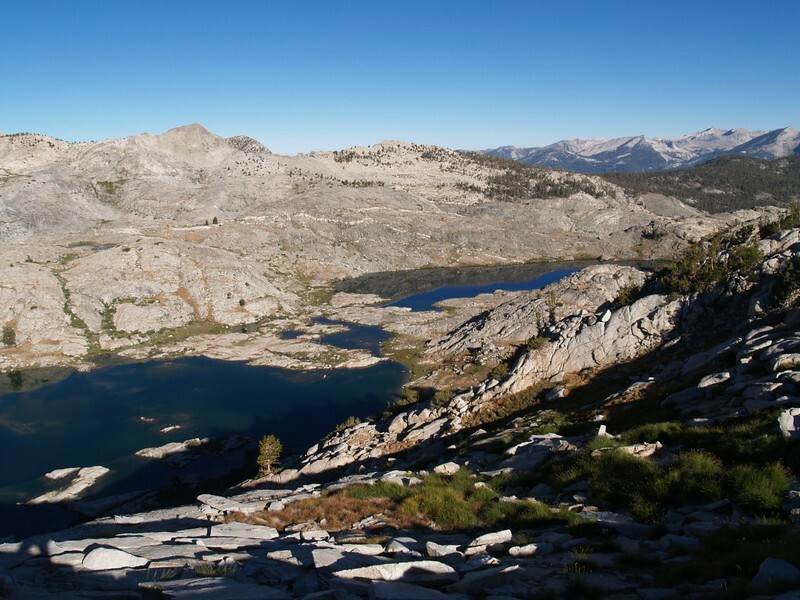 A view of the lower (northern) end of the Volcanic Lakes Basin. 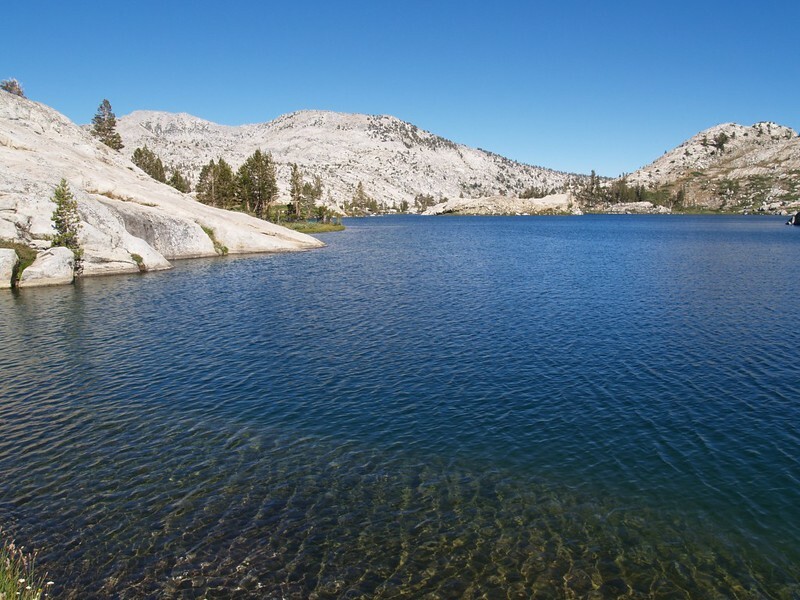 Granite Lake. Our tent can be seen under the trees on the right. View from the northwest cove on Granite Lake. Our campsite was near those trees on the left. We could see trout swimming in the cold clear water below us. 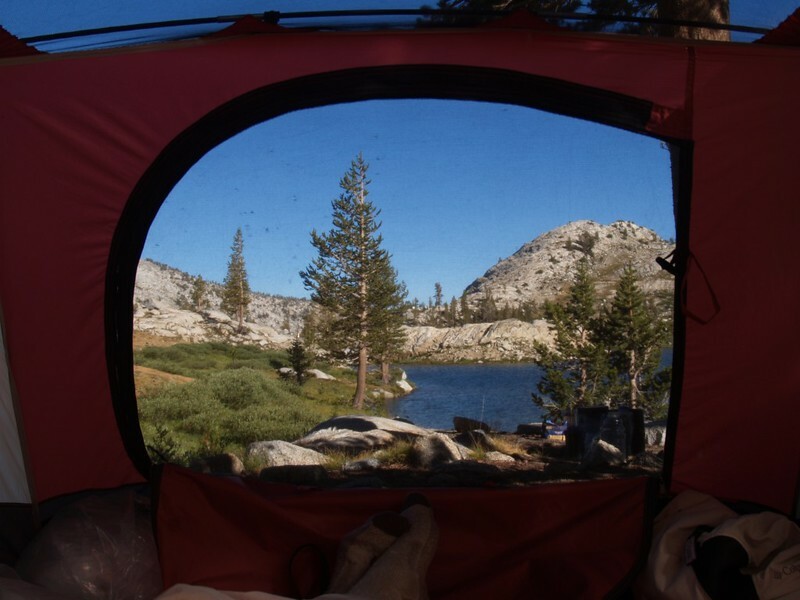 The view from inside our tent at Granite Lake. Nice! We were the only people camping there. The next morning there was more frost, and we didn’t really want to get out of the tent. It was so warm under the goose down. But we got up anyway, and then we hiked the entire eleven mile distance to Roads End in one shot. 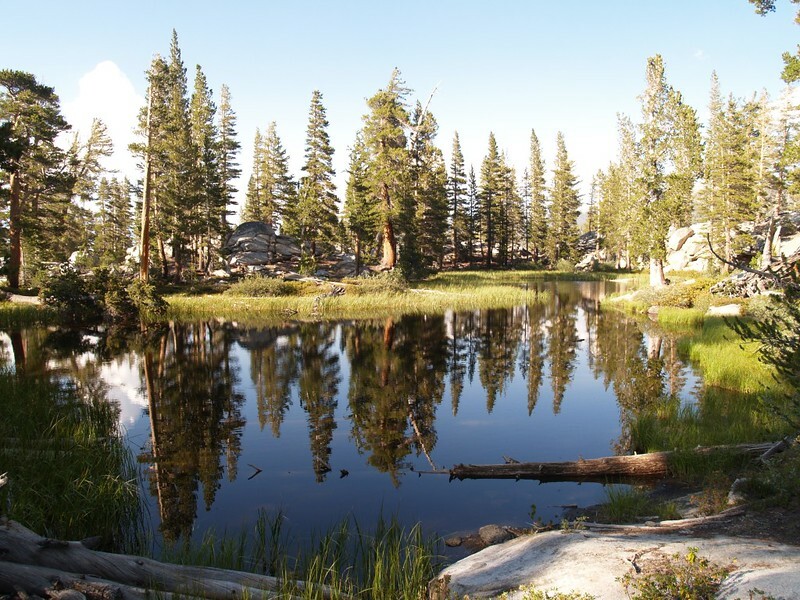 After all the lonely beauty of the high country, we couldn’t bear to stay at crowded Lower Tent Meadow another night. But maybe we should have stopped. 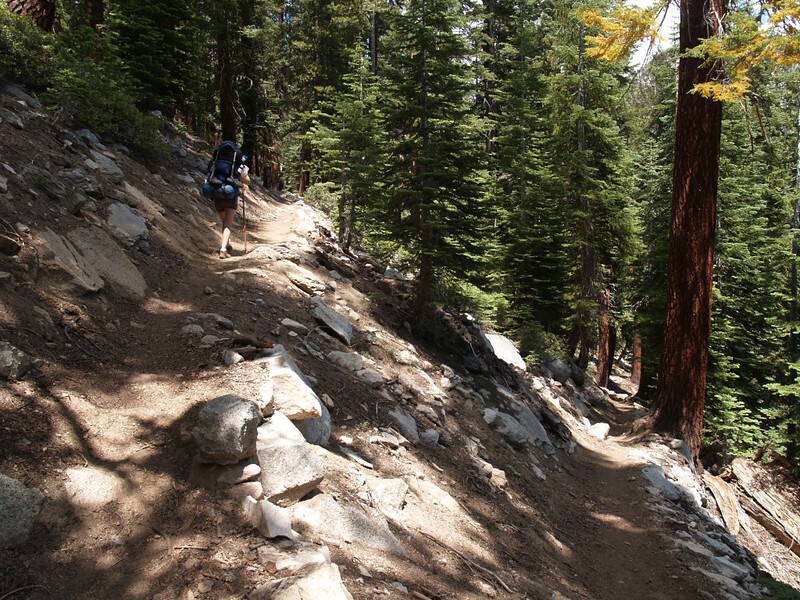 Our feet were beat by the time we got to the car – a five thousand foot descent is not easy on the body. But we made it! 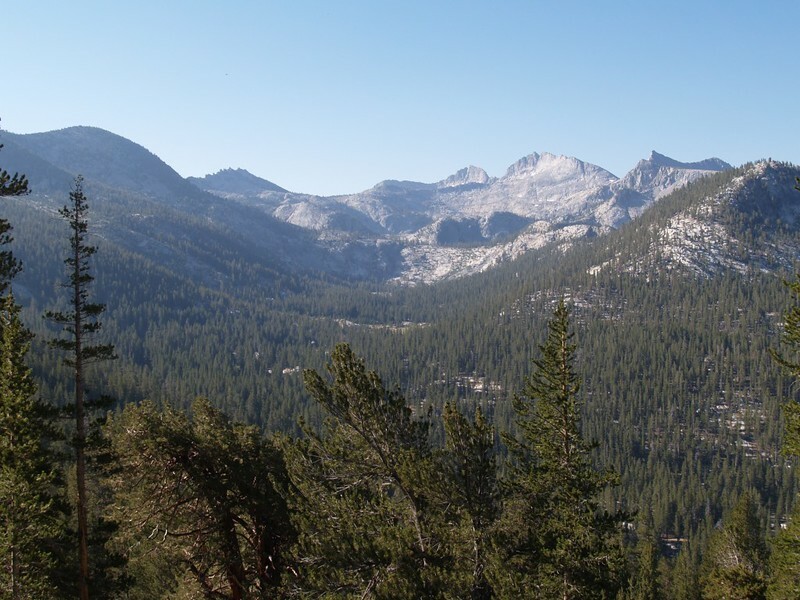 A final view of Granite Basin. Back at the car. The hike was over, after a long, 11-mile downhill slog. Our feet were hot and our clothes were dirty, but we were back in civilization. Really cool trip report, and such beautiful pictures! I want to be next summer already!